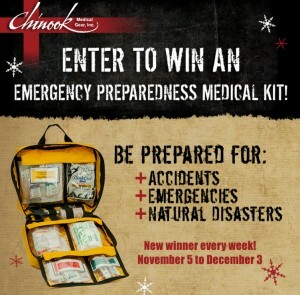 Chinook invites fans to enter to win our new Emergency Preparedness Medical Kits and prepare for emergencies around the home, office, or on the road this holiday season! To celebrate Chinook’s highly anticipated EPMK collection and help raise awareness about emergency preparedness during a critical time of year, Chinook is launching the ‘Give the Gift That Could Save a Life’ social media sweepstakes on Facebook this month (Nov. 5th through Dec. 3rd). Everyone is invited to register to win one of the new kits through the EPMK Holiday Sweepstakes entry form on Chinook’s Facebook page at http://a.pgtb.me/0bXZlW. Chinook will randomly select one winner each week for four weeks leading up to the holidays. 2 million Americans are affected by natural disasters annually and accidental emergencies are the 5th leading cause of death. The holidays and winter months present additional dangers ranging from severe weather, exposure and icy roads, to the loss of heat and power at home or in the office. Yet despite statistics, nearly half of Americans lack emergency supplies for use in the event of a natural disaster or medical emergency in the home, vehicle or workplace. In addition to the sweepstakes, Chinook is also offering a free Frontier™ Emergency Water Filter System gift to all customers who purchase the EPMK Level 1 or Level 2 in celebration of the holidays. 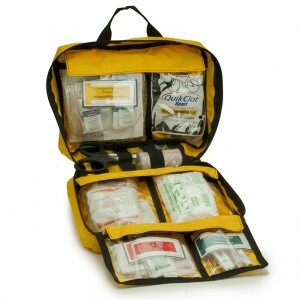 The new kits are available for advanced purchase now at www.chinookmed.com and will ship at the end of November. Customers will also receive exclusive access to EPMK training and product demonstration videos from Chinook’s highly experienced product development team. Customer simply enter the code HOLIDAYPREP upon checkout to take advantage of this limited time offer. Copyright © 2013 Chinookmed.com Blog.